International Exchange Center, Osaka, Namba, Umeda. 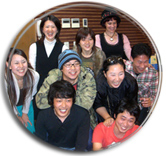 Japanese Language School and Counseling for foreigners in Japan. Welcome to the International Exchange Center Osaka! The International Exchange Center is a warm and friendly place for international people living in Japan to meet. It's the best place to come in Osaka if you are looking for a Japanese language school where you can learn to speak, read and write Japanese. We also offer counseling services for foreigners living in Japan. If you are having problems with life in Japan, need advice on your visa status, or are going through a divorce, one of our experienced counselors can give you advice in your own language. So feel free to drop in at any time to meet us. Come and have a drink with us at one of our international parties, or join one of our classes for a free Japanese trial lesson.